Established in 1958, Amber Mountain National Park is located in the far north of Madagascar on top of a volcanic massif that makes it ecologically distinct from the surrounding lowlands. Whereas the rest of the region has a semi-arid climate, Amber Mountain comprises 71 square miles (185 square kilometers) of lush forest intersected by life-giving streams and rivers. It is famous for its waterfalls and scenic crater lakes, while its trees provide a home for countless endemic animal and bird species. Also known as Montagne d’Ambre National Park, it’s a unique destination for intrepid explorers either in its own right or as part of a longer Madagascar itinerary. Amber Mountain National Park boasts no fewer than three different types of forest: montane rainforest, mid-altitude rainforest and dry deciduous forest. This range of habitats means that it’s one of the most biologically diverse places in the country. 25 mammal species live here including the endemic ring-tailed mongoose and the Malagasy civet, and eight kinds of lemur. Of the park’s resident lemur species, the crowned lemur, Sandford’s brown lemur and aye-aye are classified as endangered while the northern sportive lemur is on the critically endangered list. The park is also a haven for reptile species with 59 different types of frogs, snakes, geckos and chameleons. Make sure to keep an eye out for the endemic Amber Mountain leaf chameleon — one of the smallest reptiles on Earth. Of the park’s 75 bird species, 35 are endemic including the long-billed bernieria and the beautiful pitta-like ground roller. Birders come from far and wide for the chance to spot the endangered Amber Mountain rock thrush, which is locally endemic to one particular area of the Amber Mountain massif. Botanists will also find plenty of interest, with over 1,000 plant species including many rare kinds of orchid, fern and liana. To discover the park’s natural wonders for yourself, don your hiking boots and explore 19 miles (30 kilometers) of marked hiking trails. Routes range from easy one-hour walks to challenging eight-hour treks — and if you want to spend longer in the park, it’s possible to combine several trails for an overnight adventure. 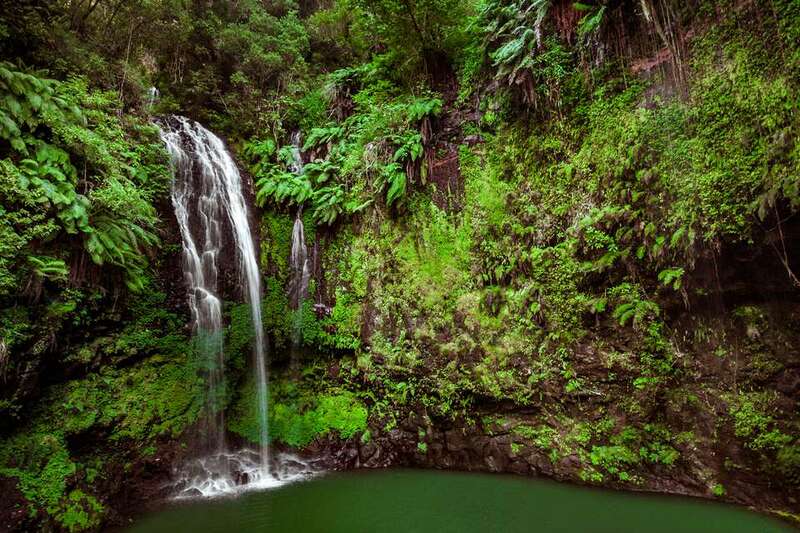 One of the easiest and most popular trails leads to Cascade Sacrée, a sacred waterfall surrounded by a fern-fringed grotto. There are two more waterfall walks: the medium-length Cascade Antankarana and Cascade Antomboka, which involves a more challenging hike to the top of a narrow waterfall with a spectacular 260-foot (80-meter) drop. Other trails take you to the park’s crater lakes, including Lac de la Coupe Verte, Grand Lac and Lac Maudit. It’s also possible to climb to the summit of Amber Mountain. On a clear day the peak offers breathtaking panoramas of the surrounding forest and although it can be tackled in one day, many visitors choose to spread the hike over two days. If you’re interested in the park’s flora, don’t miss the Voie des Mille Arbres (Path of a Thousand Trees). An up-and-down route that takes you away from the main track, it is special for its towering exotic tree species and offers good opportunities for spotting ring-tailed mongooses. The gateway town for Amber Mountain National Park is Joffreville, located 1.8 miles (3 kilometers) northeast of the park entrance. Most visitors travel to Joffreville from the port city of Antsiranana (also known as Diego Suarez), either by private 4x4 or by taxi-brousse. The distance between the two is 21 miles (34 kilometers). From Antananarivo, the easiest way to get to Amber Mountain is to fly to Antsiranana on domestic airline Tsaradia, which offers daily direct flights (approximately two hours). Once you reach Joffreville you will be able to pay park entry fees, pick up trail maps and hire local guides at the town’s park office. Unusually, guides are not compulsory for visitors to Amber Mountain and the trails are relatively easy to navigate independently. Entry costs Ar 55,000 per adult, per day and Ar 25,000 per child, per day. Discounted rates apply for Malagasy residents and guides cost extra depending on the trails you choose and how long you want to spend in the park. If you plan to stay longer than a day, you can opt to sleep inside the park at one of several campsites. The main ones are called Campement Anilotra and Campement d’Andrafiabe, both of which have basic facilities including toilets, picnic tables and running cold water. There is no electricity, but the lack of creature comforts is more than made up for by the beautiful setting, visiting wildlife and cheap nightly rates (around Ar 4,000 per person). Staying inside the park also gives you a chance to spot nocturnal animals like the tiny brown mouse lemur. Don’t forget to purchase supplies such as firewood and food before entering Amber Mountain. For a more luxurious stay, there are a handful of options located in and around Joffreville. The best include Nature Lodge and Domaine de Fontenay. The former offers 12 simple yet cosy thatched chalets, all with ensuite bathrooms and private decks. The latter is set within its own nature park in an early 20th-century colonial villa. Choose from nine beautiful ensuite rooms and one terraced suite. Both Nature Lodge and Domaine de Fontenay have on-site restaurants serving traditional Malagasy and French cuisine. Although Amber Mountain National Park has a tropical climate, its elevation means that it is typically much cooler than the surrounding lowlands with daytime temperatures of 68-77 F (20-25 C). In winter (June to August), nights can be cold and campers should make sure to pack warm clothes and sleeping bags. The rainy summer season runs from December to April and at this time the trails and access roads may suffer flood damage. However, this is the optimum time for reptile and amphibian sightings. The cooler dry season (May to November) is best for birdwatching and clear summit views — although it still rains most days. Each season has its pros and cons but September to November is generally considered a great time to travel to Amber Mountain. The winter crowds have dispersed, the weather is getting warmer and reptiles are becoming more active; but the rains are not yet as intense as they are in peak summer. Whenever you travel, make sure to take anti-malaria prophylactics with you.